The zygomaticofacial nerve is a terminal branch of the zygomatic nerve, which is a division of the maxillary nerve. From the zygomaticofacial foramen, where the nerve perfortes the orbicularis oculi muscle as well as stimulates the skin on the protrusion of the cheek, the zygomaticofacial nerve arises on the face. The zygomaticofacial nerve arrives onto the surface of the face through a foramen in the zygomatic bone, after it travels together with the lower outer aspect of the orbit. Afterwards it passes via the orbicularis oculi. 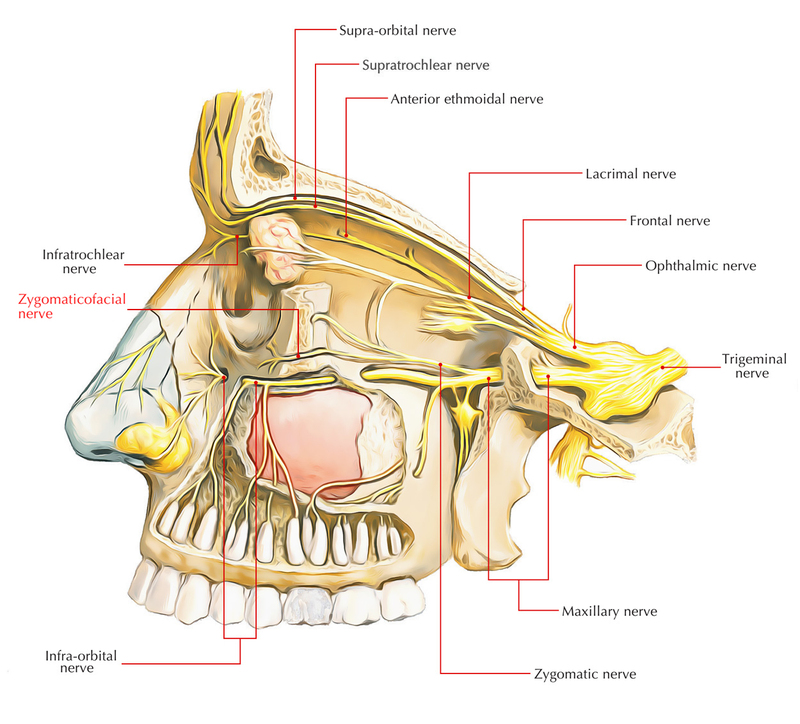 It divides together with the zygomatic branch of the facial nerve along with the palpebral branches from the maxillary nerve of the trigeminal nerve. The area of skin over the prominence of the cheek is supplied by this nerve. The zygomaticofacial nerve exits the foramen by the similar name in order to supply the skin of the malar eminence along with lateral cheek and travels alongside the inferolateral orbit. Below the lateral canthus, the foramen can be palpated above the inferolateral rim and also be blocked through direct infiltration.